Welcome to WPilot. 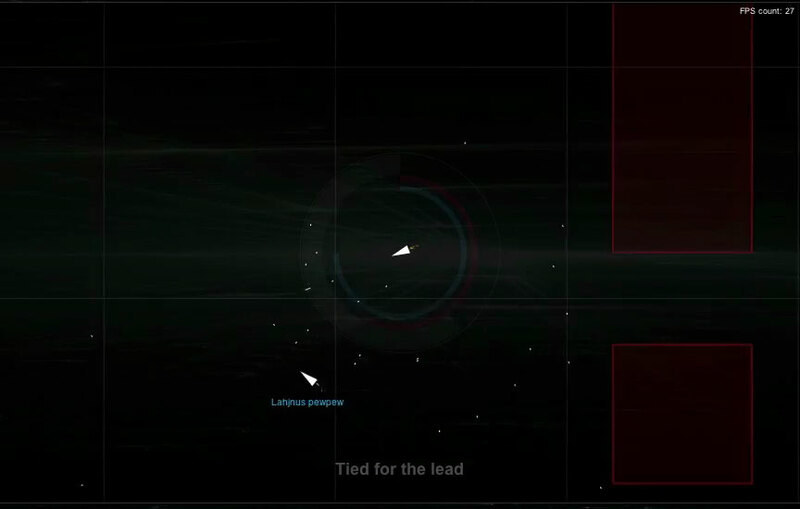 WPilot is a browser-based, multiplayer, space shooter inspired by old classic such as XPilot, Thrust and Gravity Force. Sound is currently disabled in Google Chrome. No servers available? Start a server of your own or watch a video in the Media section. The Server list is disabled. Your browser is currently not supported. 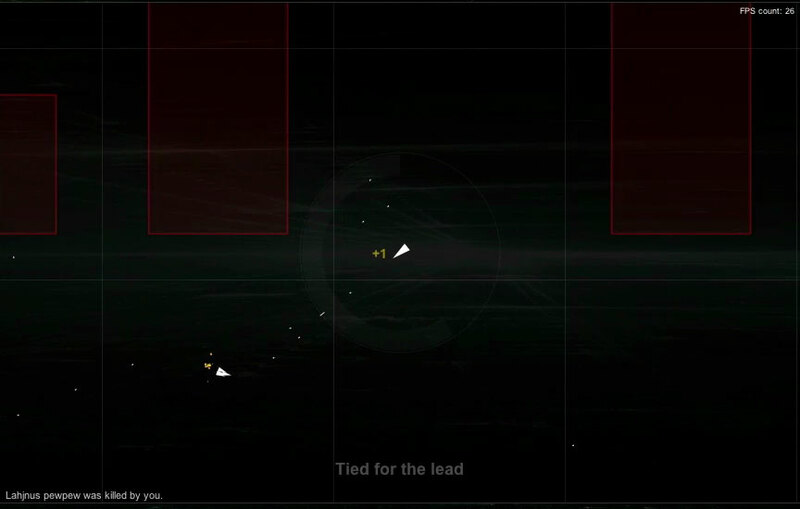 The gameplay is pretty simple, avoid getting shoot while shooting your opponents. 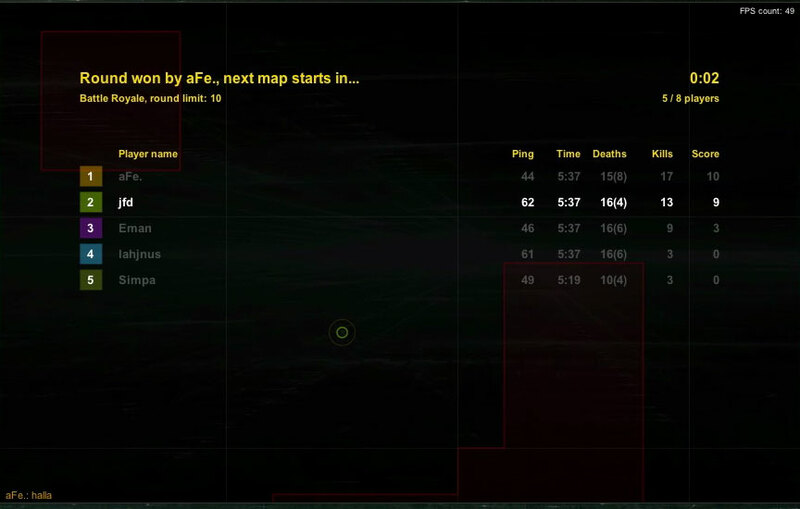 The first player that reaches the score limit wins the round. Your ship is easy to maneuver, but hard to master. The up-arrow will thrust your ship in current direction. Use your left- and right-arrow to rotate your ship left and right. Your only defense against walls, and opponent bullets is your shield, access it by down-arrow. While activated, you are indestructible. The shield isn't free of charge though, it will quickly drain our energy. There are two ways to defeat your opponent and get points. You can either bump into them with your shield activated or you can shoot them with your canon. Each bullet cost a bit of energy, so try to save some incase you'll need the shield. Each game starts in warm-up mode. It let's you try things out and battle a bit until enough players are ready. When you are ready for some real action, press the r-key. When enough players is ready, the game starts. What would a space-shooter be without compelling enhancements? WPilot contains three kinds of destructive powerups, each one improving your vessel's arsenal. Powerups are possible to combine and can help even the worst pilots to get a few kills. Rapid fire significantly increases your reload rate and lowers the energy cost of each bullet. 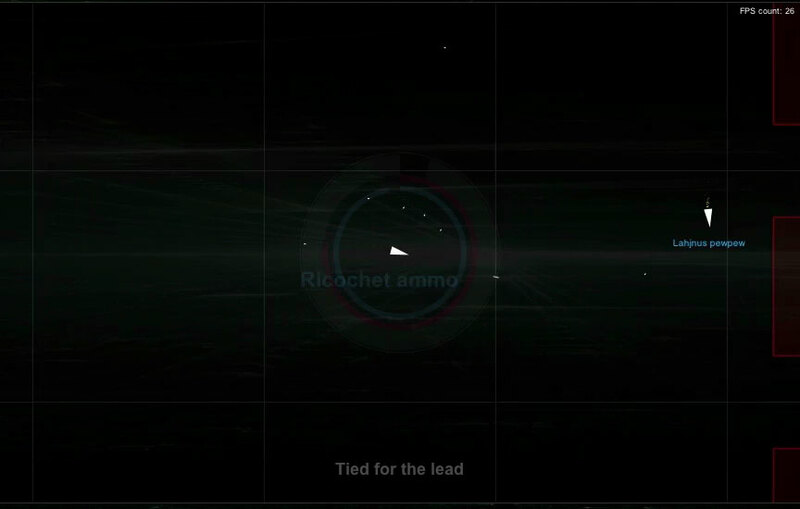 Ricochet gives the bullets wall bouncing abilities, opponents will quickly lose track of some projectiles and succumb to your superiority. Spread fire, the most feared enhancement known to WPilots, compliments your cannon with two additional side cannons to satisfy the spray and prey concept. You score a point when blowing up an opponent and you will loose a point when crashing into a wall due to bad maneuvering skills. The first player that reach the round limit wins. You can taunt, chat or salute your opponents by pressing the enter-key. The prompt can also be used to issue commands. For example, you can change your name in-game by typing "/name your_name" (without the quotes). WPilot contains a total of five official maps. You can create your own map with the built-in map-format. This is the built-in standard map. Search and destroy your opponent in the outer rim or try to get some powerups in the center area. Four areas with several small passages between them, camp a single area or outmaneuver your foes in the passages? A small minimal map, designed for maximum conflict. The map contains two main areas. Each area is separated by the wall of death. The only way to go between the areas it to thrust through the small passages which is hard, so be careful. The map contains two small rooms containing powerful powerups. Risk getting ambushed for the ultimate power. We have recorded a couple of videos of WPilot in action. The videos can be found in our channels over at Youtube and Vimeo. We appreciate new material, please let us know if have something you wish to contribute. WPilot is unfortunately not playable in all browsers. This compatibility list helps you find a browser that is supported by WPilot. The browser rank gives you an indication of how well the game perform. The Recommended indicates that the browser is fully supported. There can be some quirks but nothing major. The Not recommended indicates that the game should run, but that there's one or more major quirks that causes the game to run badly. Read the description for more information. The Not supported indicates that the game won't run at all. There may be support for the browser in a future release, but no guarantee. Internet Explorer is NOT support by WPilot. WPilot depends up on Canvas which Internet Explorer lacks. There are third-party solutions that emulates the canvas object, but they are really slow. IE9 may support canvas in the future, if the team behind the browser decides to implement canvas support ( rumors indicate it). Safari delivers a good frame rate. However Safari lack support for WebSocket, so it depends upon Flash plugin as fallback. The experience is decent, but the Flash fallback can cause high latency in some situations. Webkit delivers outstanding network performance, low latency and no packet loss. Firefox for Mac delivers a great frame rate. Firefox lack support for WebSocket, so Flash is a requirement. It seems to be some kind of problem with the Flash implementation though. The ping tend to be very high, even when connecting to localhost. Latest version of Mindfield do have support for Websockets though. Google Chrome works great with WPilot! Firefox for Win delivers a great frame rate. Firefox lacks support for WebSocket, so Flash is a requirement. Even though Flash is used as fall back it delivers low latency as opposed to the Mac version. Only tested on Mac. Opera have some trouble communicating with the Flash fallback plugin. The game connects to the server 1 of 10 times. No error messages is displayed so the problem is difficult to debug. There also seems to be some kind of problem with the underlying text rendering interface. Some texts are not rendered at all. The frame rate seems to be great, but the game is unplayable. Yesterday's browser wasn't built to handle fast graphics applications and low-latency game network protocols. This is about to change dramatically, the browser standard factory is currently cooking up some very interesting new features for our browsers. New HTML5 technologies such as Canvas, WebSocket and WebGL will change the way we think of games and applications in the browser. As you can see the results so far is pretty impressing. The game engine runs at 60 ticks per second. 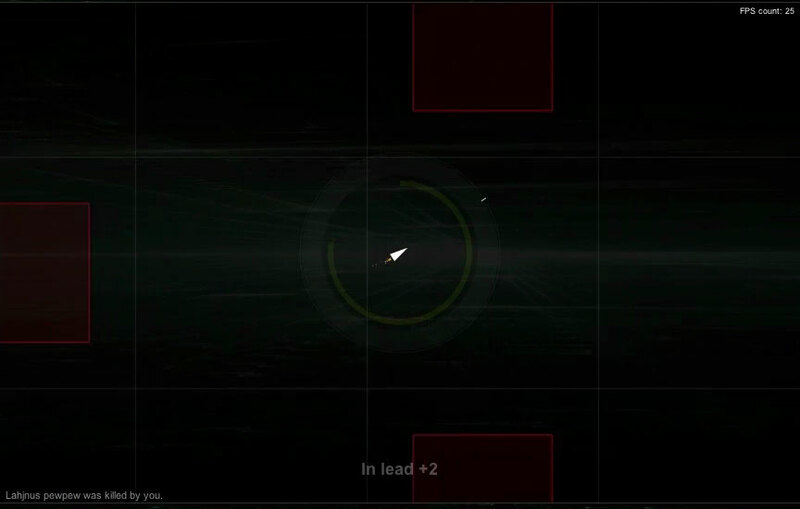 Each game tick handles collision data, movement and game rules. The server is constantly sending position updates to each client which requires a low-latency connection between the two parties. The native implementation of WebSocket (In Safari and Google Chrome) handle this very well. The fallback plugin is kind of unstable on the mac but seems to do a good job on Windows machines. WPilot and similar applications will be more stable and faster as browser vendors continues to implement new and exciting features listed in the HTML5 draft. You probably want to change the server name, region and port no. Use the --name switch to change name, the --region switch to change region and the --ws_port to change the TCP port to listen on. The WPilot server has a built-in HTTP-server that delivers all client releated data. The server is by default started and is serving the data at port 8000. Set the --http_port switch to 0 to disable HTTP server. The current version of the server is a so called BETA version. Things can break. You can put server in "debug-mode" by adding the --debug switch, which will print additional debug information in the console. This may help you to track down bugs. We have limited server capacity, so please concider to list your server in The Public server list (the list at the top of this page). Send your "ws://" host address to email to dahlberg.johan AT gmail com. We will list it as soon as possible. WPilot comes with a set of maps. All maps is located in the the "$INSTALLDIR/maps" directory. You can choose to circle between multiple maps at startup. Use the --map for each map you want to play. It's also possible to change map in-game. Note: The reason argument MUST be entered in order to kick someone. This is an Open Source project, anyone can download and play around with the code. The easiest way is to post an issue ticket over at GitHub. You can also mail me at dahlberg.johan AT gmail com. Bug fixes and optimizations is appreciated. If you are an expert on Opera or maybe find a way of getting this to work on IE, we'd really appreciate your contribution to the main project. When you are done with your bug-fix or performance increaser, press the "pull request" -button in your forked repository. This software is released under a MIT-style license. You can do pretty much what you want with it.